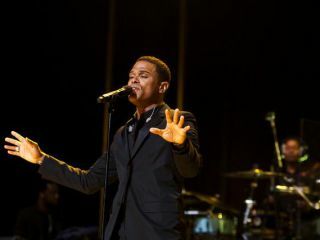 Maxwell in performance at the 2009 Essence Music Festival. In what can only be described as a remarkable comeback, soul artist Maxwell is set to score a major US hit this week with his new album BLACKsummers'night (the first of a trilogy of planned releases). Billboard is reporting that first-week sales of the record could end up being anything between 275,000 and 325,000, which is more than respectable for any new release in this day and age. This might not be enough to hold Michael Jackson's Number Ones compilation off the top spot, but a high chart placing for BLACKsummers'night seems assured. Maxwell's achievement is even more impressive when you consider that this is his first release in almost eight years (he'd pretty much fallen off the radar) and, as Idolator points out, it hasn't been heavily discounted by online retailers. "BLACKsummers'night's success will undoubtedly cheer those who have an appetite for 'real' soul music." BLACKsummers'night's success will undoubtedly cheer those who have an appetite for 'real' soul music. It features a live band and sounds more like Marvin Gaye's '70s output than anything currently on heavy rotation. But Maxwell isn't the only star of the '90s nu-soul movement to be making a return. Erykah Badu has just announced plans to release New Amerykah, Pt. 2: Return Of The Ankh (the follow-up to 2008's excellent New Amerykah, Pt. 1: 4th World War) and even D'Angelo, soul music's great lost voice, is said to be working on a new album (a 'teaser' single, I Found My Smile Again, appeared last year). If that comes off, all we need for a full-on revival is for Lauryn Hill to get back in the studio. While some might argue that the return of artists who first came to prominence more than a decade ago is nothing to get excited about, in an era when most R&B is typified by Auto-Tuned vocals and processed beats, many others will celebrate their re-emergence. You watch the video for Pretty Wings, the first single to be taken from BLACKsummers'night, below.